INS Visakhapatnam is the first ship of the Project 15B guided missile destroyers. Image courtesy of Indian Navy. The Project 15B guided missile destroyers are being constructed at Mazagon Dock Limited (MDL). Image courtesy of Indian Navy. INS Mormugao was launched in September 2016. Image courtesy of Indian Navy. The Project 15B class of guided missile destroyers, an improved variant of the Kolkata-class destroyers, are being built by Mazagon Dock Limited (MDL), for the Indian Navy. The contract for the construction of four Project 15B destroyers was signed in January 2011. 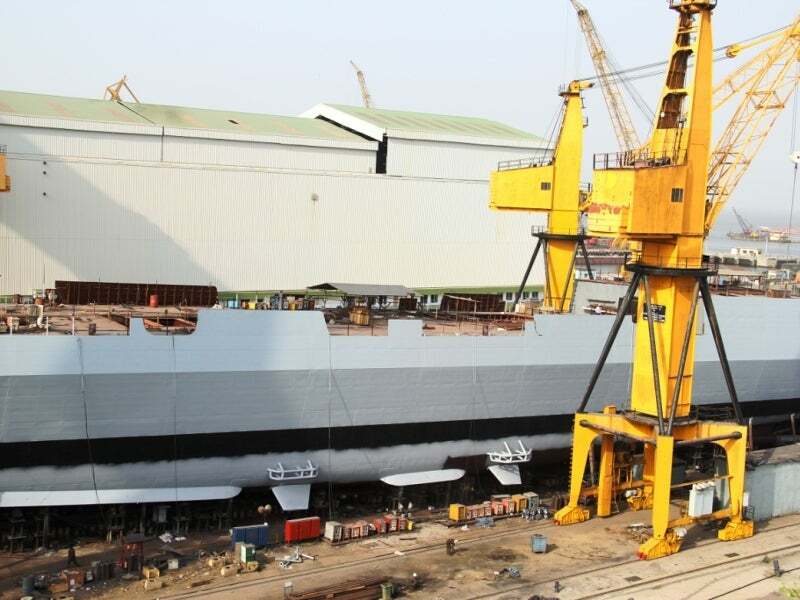 The keel for the first Project 15B ship, named INS Visakhapatnam (D 66), was laid in October 2013 and the vessel was launched in April 2015. The keel laying ceremony of second destroyer in class, INS Mormugao (D 67), was held in June 2015 and the vessel was launched at MDL shipyard in Mumbai, during September 2016. The Project 15B ships retain the hull design of Kolkata-class destroyers, but will incorporate advanced stealth features and a high degree of automation. Designed indigenously by the Directorate of Naval Design, the vessels will offer improved survivability, sea keeping and high manoeuvrability. The sleek hull design in combination with radar transparent deck fittings will make the vessels difficult to detect. With state-of-the-art weapons and sensor package, the destroyers will be one of the world’s most technologically advanced guided missile destroyers. The significant indigenous content reflects the nation’s self-reliance in warship design and ship-building. Each vessel will measure 163m-long and 17.4m-wide and will have a displacement of 7,300t. The ships will be operated with the help of 350 crew including 50 officers and 250 sailors. The accommodation and working areas will offer superior ergonomics and habitability. The destroyers will feature multiple fire zones, battle damage control systems (BDCS) and distributional power systems for improved survivability and reliability in emergent conditions. The total atmospheric control system (TACS) aboard the vessel will protect the crew from chemical, biological and nuclear threats. The ship will integrate a modern combat management system (CMS), which will conduct threat evaluation and allocate the resources based on the tactical picture compiled and weapons package available onboard. The ship data network (SDN) will carry the data from all the sensors and weapons aboard. The ship’s primary fire power will constitute vertically launched Barak 8 surface-to-air missiles (SAM), and BrahMos surface-to-surface missiles (SSM) for long-range engagement of shore and sea-based targets. "With state-of-the-art weapons and sensor package, the destroyers will be one of the world’s most technologically advanced guided missile destroyers." Two 16-cell vertical launchers aboard the vessel will be capable of launching a total of 32 Barak 8 missiles, while two eight-cell universal vertical launcher modules will allow the launch of 16 BrahMos SAMs. The forward bow deck will be fitted with a 127mm main gun, while the vessel will be installed with four AK-630 30mm guns for close-point defence capability. The destroyer will also be armed with indigenously developed 533mm torpedo launchers and RBU-6000 anti-submarine rocket launchers to provide anti-submarine warfare (ASW) capability. The aft heli-deck of the P 15B ships will support the operations of two multi-role rotorcraft including Sea King or HAL Dhruv helicopters. The state-of-the-art rail-less helicopter traversing system aboard the vessel will ensure efficient helicopter handling on the deck and the vessels will also feature a hangar facility to accommodate two helicopters onboard. The ships will be equipped with a combined gas and gas (COGAG) configuration integrating four gas turbines. The power-plant will also integrate two diesel engines and four generator sets. The propulsion system will allow the ships to achieve speeds of more than 30kt and a maximum range of 4,000nmi. Neo Power Electronics & Projects is an innovative company based in Mumbai, India that works in the field of power electronics and electrics with turnkey project execution capabilities.